It seems that carousels are becoming a right of passage for my children in any town that has one on offer. To the extent that I wonder which would win out if pushed to a decision: coca cola, gelato or a carousel ride? All along the port in Frejus to the neighbouring St. Raphael is a night market. It begins each night at 8PM and continues until 2 in the morning. It’s been a nice way to walk along, get some fresh air and enjoy the water without the punishing sun. And of course they have a carousel. Not just any carousel – this one has two floors. So tonight the kids and I head to out walk to it. It is further away than I initially thought, but it manages to absorb our evening rather nicely and gives Chris some time to himself. Besides – the kids finish their respective meals each night with a substantial amount of gelato. Cooper has settled on one ball of chocolate and one ball of lemon, while Lucy prefers strawberry. They will visit the ice cream bar at least twice after dinner. Very unFrench. 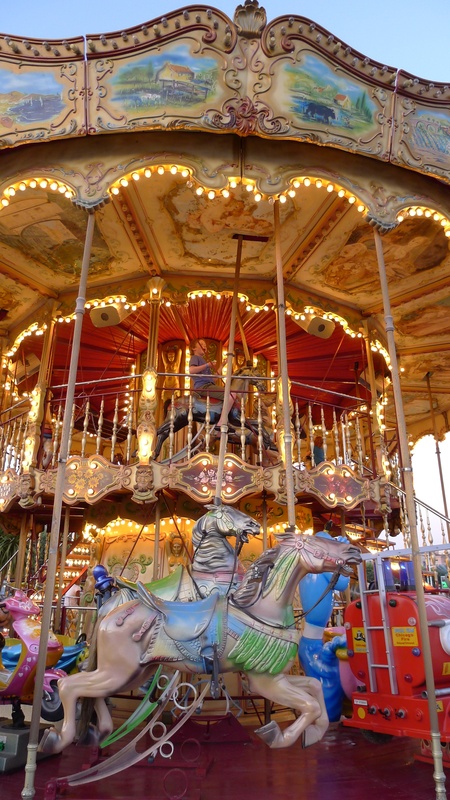 Here is the carousel in St. Raphael. I am surprised that Cooper is still keen to get on them. I think he is on the verge of thinking that they are too babyish, but I am thankful that we aren’t there yet.